Notes: Start around 70% or less of your 1RM and feel free to add weight up to 85% of your 1RM. Keep your movements technically! Work from the hi-hang or just below the knee if you struggle hitting good positions from the ground. Notes: People can substitute a 400 meter and 800 meter run respectively for the workout if they would like. Please note the first part of this wod, go all out! Go for a PR! Efficient running is all about reducing muscular effort and taking advantage of all the forces involved in nature. The single greatest force involved in all movement is Gravity, and it is constant in its application of force. The Pose Method takes advantage of this by “Falling”, or by breaking at the ankles to tilt your body weight forward and therefore propel you. This utilizes the downward force of Gravity and redirects it to produce forward motion, thus eliminating any need to push off the ground. I also pointed out that Gravity is constant, meaning it is an endless supply of free energy for you to take advantage of. You can pay with muscular effort, or you can have some charity from Gravity. If you have come to track night or heard any of the coaches talk about the Pose Method, then the above should be familiar. But the second biggest force involved in running is less understood and talked about less frequently, and that is Muscle Elasticity. Your muscles and tendons are elastic, and just like a rubber band or spring, can store and release energy. This can only be accomplished, however, while running at or above 180 steps a minute (or at a 90+ cadence if you are counting one foot only). You must load and unload the “spring” in the Achilles tendon and calf quickly in order for it to work. The same goes for the hamstrings. You can test this for yourself. Hop up and down like you would with a jump rope. You are “bouncing”, not jumping. The foot touches on the ball of the foot and the knees stay bent to absorb energy and immediately release it. This bounce can be maintained in a relatively relaxed state. Now, try it again but this time pause for one second at the bottom. Which way is harder? The latter loses all the loaded energy by pausing at the bottom, and requires muscular effort to “jump” and continue hopping. If you run at a slow cadence, you are essentially pausing at the bottom of every step and wasting your body’s natural elastic property. If you need help with cadence, download a free metronome app and set it to 90 steps per minute. Pick one foot and have it land on every beep while running to see how it feels. This adjustment alone will dramatically increase your running efficiency and speed at any pace. 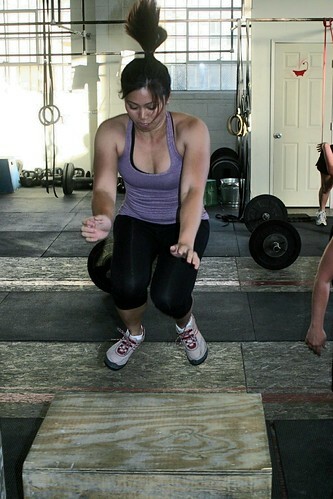 If you want to develop greater muscle elasticity, you can jump rope or perform bounding box jumps. Take a look at the video above with Martina. The slow motion replay is a great example of loading and unloading of stored energy. Notice she lands on the ball of the foot, lets her heel kiss the ground, keeps the knees bent, and then immediately releases the energy to spring up. Martina has very strong calves from a background in dancing, and it shows in her box jumps and running. The second video is from Mobility WOD and shows quick ways to stretch your Achilles and improve range of motion to get the heel cords of a cheetah. Cheetahs have very supple heel cords, and they are very fast. In summary, lean at the ankle to fall and take advantage of Gravity which is free and always present, run at a 90+ cadence to take advantage of muscle elasticity, do bounding box jumps and the mobility wod to work on this in the gym and transfer it outside to your runs. Fulfill your human nature! Become the ultra-marathoner that evolved over millions of years!